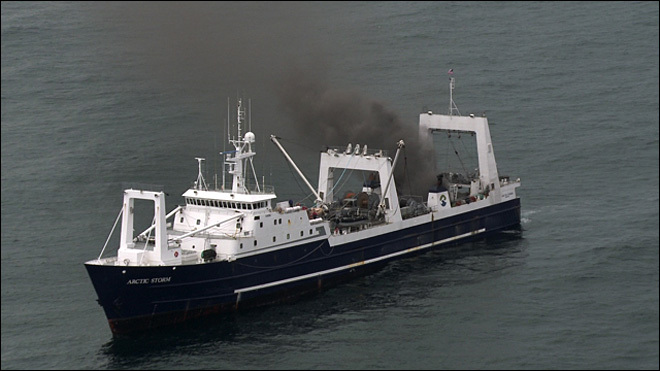 An engine room fire was reported yesterday afternoon aboard the 334-foot fishing vessel ARCTIC STORM off the Washington Coast, about 30 miles west of Gray’s Harbor. The vessel’s crew reported the fire at approximately 3:30 p.m., notifying the Coast Guard that there was an uncontrollable engine room fire. At the time the fire broke out, there were 120 crewmembers aboard. The Coast Guard dispatched two MH-60 Jayhawk helicopter crews from Air Station Astoria and three 47-foot motor lifeboat crews to the scene. The Coast Guard also notified other ships in the area of the emergency via an Urgent Marine Information Broadcast. The crew of the ARCTIC STORM was able to get the fire under control later in the evening before the Coast Guard arrived on scene, using the Halon chemical firefighting system aboard the ship. However, as of yesterday evening it was still too hot to enter the engine room and assess the damage. The Washington State Supreme Court ruled en banc yesterday in Dean v. The Fishing Company of Alaska, Inc., a case involving wrongful termination of a seaman’s right to maintenance and cure. The court ruled that where a seaman’s maintenance and cure have been cut off by the vessel owner, the seaman is entitled to have these benefits reinstated pending trial unless the vessel owner can provide unequivocal evidence that the seaman has reached maximum cure. Ian Dean worked aboard a fishing vessel owned by The Fishing Company of Alaska (FCA). Dean, standing 6 feet 3 inches tall, was assigned to work in an area with a low overhead and thus had to work stooped over. While aboard the vessel, Dean developed pain in his neck and hands. When he left the vessel, he sought medical treatment and FCA began paying maintenance and cure, as required by general maritime law (for more information on a seaman’s right to maintenance and cure, click here). After paying Dean’s maintenance and cure for just over three years, FCA stopped paying when it obtained the opinion of a physician that Dean’s injuries had reached maximum cure. At the time when FCA cut off Dean’s maintenance and cure, Dean’s own physician opined that Dean’s injuries could benefit from additional treatment. Fish processors working on fishing vessels in Alaska work long hours under difficult working conditions. Unfortunately, hand and arm injuries are common in the Alaska fishing industry. The hands of fish processors or fishermen can get caught in moving Baader processing equipment, augers, unguarded machinery, bait choppers, conveyor belts, cut by knives used for processing fish, smashed by boxes of fish product inside the factory, or subject to frostbite while working in freezing conditions in the freezer. Whatever the cause of the hand injury, these injuries can have life-long impacts on fish processors and their families. Over the years, the lawyers at our firm have collected millions of dollars for fish processors and fishermen suffering from traumatic hand and arm injuries, including amputations of the arm, hand, and fingers. We know that these cases demand special attention and the legal expertise of seasoned maritime injury lawyers with a background in fish processing and factory trawler injuries. Much of the equipment and processes on board a factory trawler are unique to the fishing industry and it is important that the lawyers understand how the equipment is used and what an employer should do to protect fish processors from hand injuries. Fish processors on factory trawlers work long hours under difficult and often dangerous conditions. Injuries are common and can change your life forever. In the wake of an injury, it is important that a fish processor understand the important differences between the Jones Act and Alaska state workers’ compensations laws. If the processor was injured in the territorial waters off Alaska (within three miles) on a factory trawler or processing barge, you have the right to bring a state workers’ compensation claim and may also seek additional compensation under the Jones Act. If you are injured outside of state territorial waters (more than three miles from shore) on a factory trawler, you are likely covered under the Jones Act and general maritime law. Benefits for Injured Fish Processors Under Alaska State Workers’ Compensation. Under state workers’ compensation schemes, an injured fish processor only has to show that the injury occurred at work to recover workers’ compensation benefits. These benefits may include time loss (usually a percentage of your regular wage), medical benefits, retraining costs in some circumstances, and a partial permanent disability award if you sustain a permanent injury. The fish processor does not need to show that the employer was negligent in causing the injury. However, the benefits under workers’ compensation are limited and, in most instances, the Jones Act provides increased compensation for an injured fish processor. If you are injured within Alaska territorial waters, many fish processing employers will try to send the injured fish processor into the Alaska workers’ compensation system where the benefits are usually less than what may be recovered under the Jones Act. Although you can pursue benefits through the workers’ compensation scheme, you should also consult with an experienced maritime personal injury lawyer to determine whether a Jones Act claim would provide additional benefits not available under the Alaska workers’ compensation scheme.